And they said it couldn't be done. 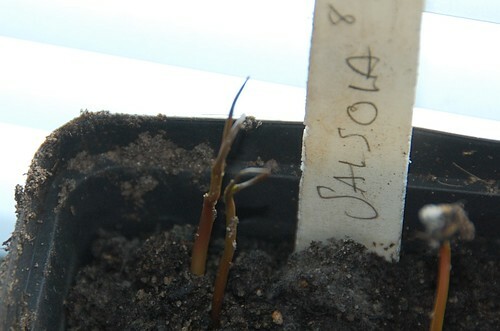 On the 8th of April I ignored the very sensible suggestions from Realseeds on how to grow their Salsola and planted some in a pot to leave in the darkest dampest corner of my north facing bedroom window. I'm pleased to say that this is just as good as starting seeds outside at this time of year and a considerable comfort, at least I know that something is going to grow for me. Liscari Sativa (Wiki calls it Salsola soda) is a funny little salad plant, salt tolerant and often likened to samphire but better suited to garden cultivation than that salt marsh dweller. The Wikipedia entry is somewhat rambling and imprecise but talks of the commercial uses of this plant which has a long history of being burnt to provide soda ash for glass making and soap. It was particularly important in Italy for making Murano Venetian glass in the 15th century. Fascinating as all that is, I'm just going to eat mine if they ever get big enough to harvest. Ottawa Gardener is eating her wild vegetables, which some might call weeds. The Cuban currency system explained. I wasn't able to leave a comment but I am grateful for this article. Cuba is a country which I have a great interest in and wish a much better future for.